Diabetes is a serious disease. Many people who have seldom don’t see the real danger behind the disease. 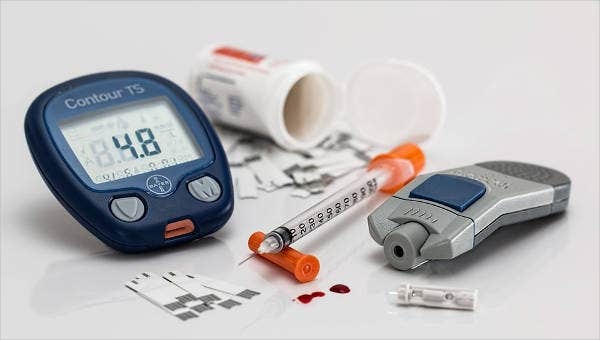 With diabetes, patient will really need to say farewell to their old lifestyle and adapt to a new one that is more appropriate to their condition. Patients will really need to have enough discipline to observe a strict low sugar diet while also avoiding a stagnant lifestyle. 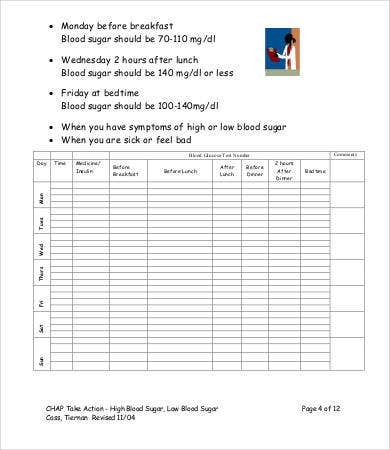 They will also need to regularly check on their blood sugar level to determine if they need to have their medication changed. 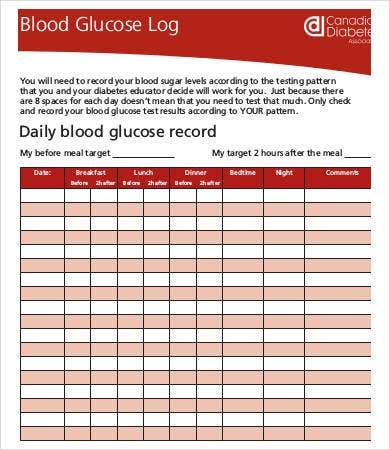 For the convenience of both diabetic patients and caregivers of diabetics, we have for you our selected Blood Glucose Level Chart Templates that you can use to keep track on the blood sugar level of the patient. These have been searched and carefully selected from the Internet to suit the demands of our consumers. 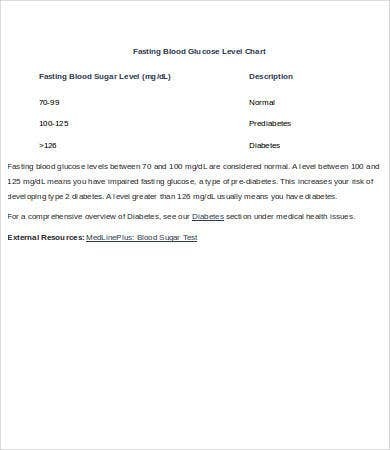 The blood sugar charts on our website vary in accordance to what our clients are asking from us. 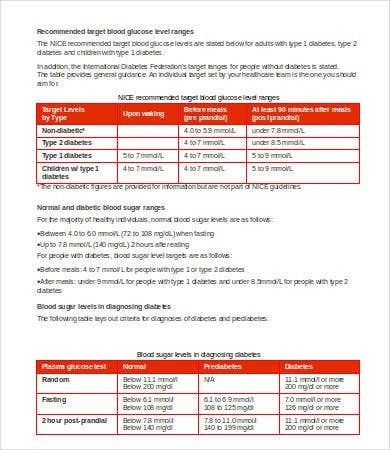 We have charts containing the normal range of blood sugar for patients undergoing a fasting blood glucose test. 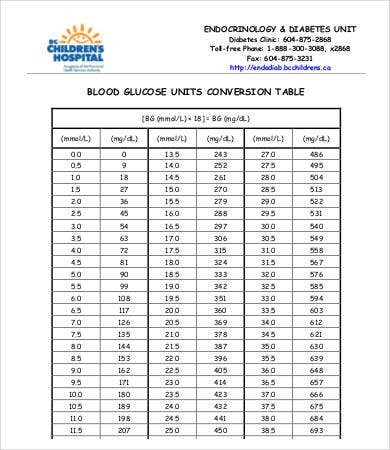 We also have conversion charts if you’re glucometer follows a different unit of measurement than the one followed by your healthcare provider. 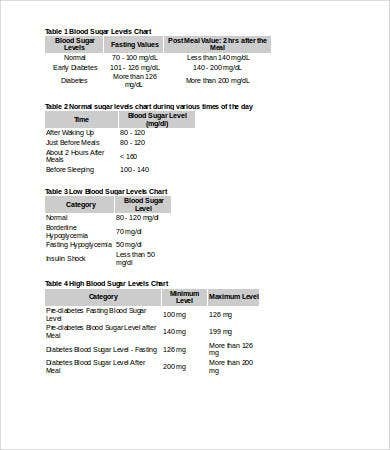 We not only provide charts for patients with elevated blood sugar, we even have charts for patients who are at high risk of hypoglycemia, or low blood glucose. 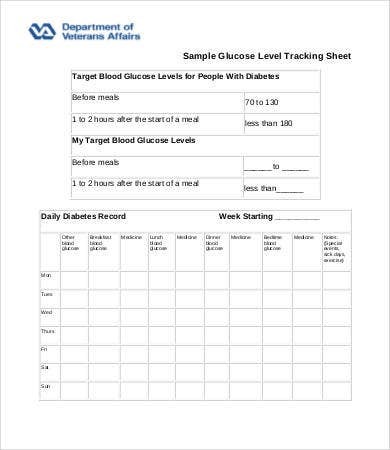 And we also have blank blood glucose charts for you to actively compare your day-to-day results with the normal values. Why do we need to monitor our blood sugar levels? For undiagnosed diabetics, they will be able to determine their usual blood sugar level either by fasting or by random testing. You will be able to determine the effectivity of your medications and if you need to acquire a new prescription from your provider. Learning when to get an insulin shot. You will be able to know the food and/or drinks that you are allowed to take in and the food and/or drinks that you are prohibited from taking in. 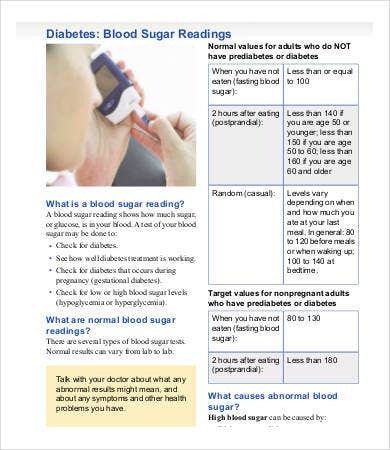 How often should diabetic patients have their blood sugars tested? It all depends on the provider’s advice, but it is commonly done an hour before meals. For chart templates used to monitor the Blood Pressure, you can check out the Blood Pressure Chart Templates. And for chart templates exclusively for the Excel, you can also check out the Excel Chart Templates. 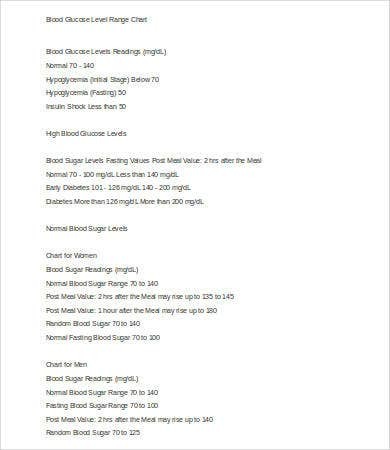 The Blood Glucose Charts on our website have been properly picked out by professionals who have and extensive knowledge on the field, and they know very well the demands from diabetic clients. These charts can easily be downloaded from our website in Doc, Docx, and high-resolution PDF formats for your convenience. Simply download the charts on your computer, and you can then print them on to a regular coupon bond. 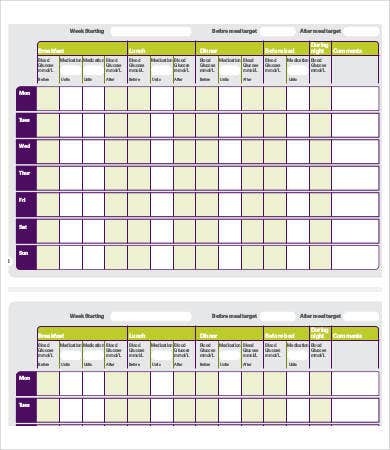 For other chart templates, you may also check out Medication Chart Templates. But if you are looking for even more chart templates, scroll down and feel free to check out the other links provide below.